Shot by Accident.—About twenty minutes past eleven o'clock last evening Michael Gardner, aged 18 years, son of Bernard Gardner, No. 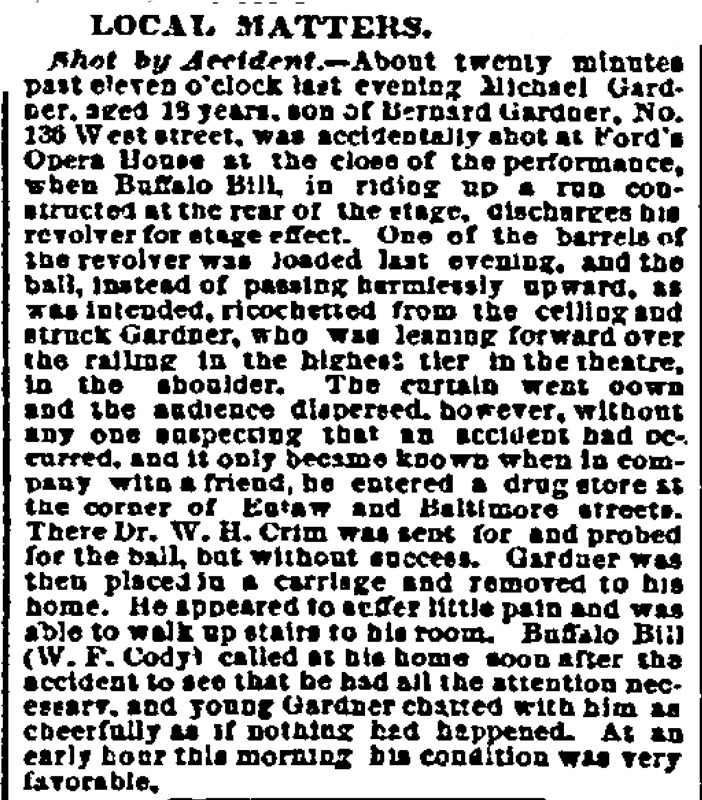 136 West street, was accidentally shot at Ford's Opera House at the close of the performance, when Buffalo Bill, in riding up a run constructed at the rear of the stage, discharges his revolver for stage effect. 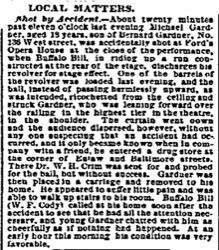 One of the barrels of the revolver was loaded last evening, and the ball, instead of passing harmlessly upward, as was intended, ricochetted from the ceiling and struck Gardner, who was leaning forward over the railing in the highest tier in the theatre, in the shoulder. The curtain went down and the audience dispersed, however, without any one suspecting that an accident had occurred, and it only became known when in company with a friend, he entered a drug store at the corner of Eutaw and Baltimore streets. There Dr. W.H. Crim was sent for and probed for the ball, but without success. Gardner was then placed in a carriage and removed to his home. He appeared to suffer little pain and was able to walk up stairs to his room. Buffalo Bill (W.F. Cody) called at his home soon after the accident to see that he had all the attention necessary, and young Gardner chatted with him as cheerfully as if nothing had happened. At an early hour this morning his condition was very favorable.